The Twenty-fourth United States Congress was a meeting of the legislative branch of the United States federal government, consisting of the United States Senate and the United States House of Representatives. It met in Washington, D.C. from March 4, 1835, to March 4, 1837, during the seventh and eighth years of Andrew Jackson's presidency. The apportionment of seats in the House of Representatives was based on the Fifth Census of the United States in 1830. 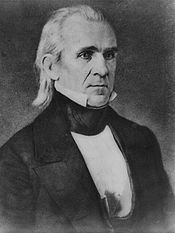 Both chambers had a Jacksonian majority. December 28, 1835: The Second Seminole War began. Seminole fighter Osceola and his warriors attack government agent Thompson outside Fort King in central Florida. 1835: Toledo War fought between Ohio and Michigan Territory over the city of Toledo and the Toledo Strip. February 3, 1836: United States Whig Party held its first convention in Albany, New York. February 23, 1836: Siege of the Alamo began in San Antonio, Texas. July 11, 1836: President Andrew Jackson issued the Specie Circular, beginning the failure of the land speculation economy that would lead to the Panic of 1837. July 13, 1836: U.S. patent #1 was granted after filing 9,957 unnumbered patents. November 3 - December 7, 1836: 1836 presidential election: Martin Van Buren defeated William Henry Harrison, but Virginia's electors refused to vote for Van Buren's running mate, thereby denying victory to any Vice Presidential candidate. December 4, 1836: Whig Party held its first national convention, in Harrisburg, Pennsylvania. December 15, 1836: The U.S. Patent Office ( USPTO) burned in Washington, DC. During this congress two Senate seats were added for each of the new states of Arkansas and Michigan. During this congress one House seat was added for each of the new states of Arkansas and Michigan. Senators were elected by the state legislatures every two years, with one-third beginning new six-year terms with each Congress. Preceding the names in the list below are Senate class numbers, which indicate the cycle of their election. In this Congress, Class 1 meant their term began in the last Congress, requiring re-election in 1838; Class 2 meant their term began with this Congress, requiring re-election in 1840; and Class 3 meant their term ended with this Congress, requiring re-election in 1836. The 4th district was a plural district with two representatives. There were four plural districts, the 8th, 17th, 22nd & 23rd had two representatives each, the 3rd had four representatives. There were two plural districts, the 2nd had two representatives, the 4th had three representatives. (2) Vacant Senator-elect Charles E.A. Gayarre had resigned on account of ill-health. Successor eas elected December 21, 1835. John M. Niles ( J) December 21, 1835. (3) Isaac Hill ( J) Resigned May 30, 1836, to become Governor of New Hampshire. (2) New seats Arkansas was admitted to the Union. Its new Senators were elected September 18, 1836. William S. Fulton (J) September 18, 1836. (3) Ambrose H. Sevier (J) September 18, 1836. (3) Alexander Porter ( AJ) Resigned January 5, 1837, due to ill health. (1) New seats Michigan was admitted to the Union. Its new Senators were elected January 6, 1837. Lucius Lyon (J) January 26, 1837. (2) John Norvell (J) January 26, 1837. ^ "U.S. Senate: Richard Mentor Johnson, 9th Vice President (1837-1841)". www.senate.gov. Retrieved 8 April 2018. ^ "A Century of Lawmaking for a New Nation: U.S. Congressional Documents and Debates, 1774 - 1875". memory.loc.gov. Retrieved 8 April 2018.